This is a critical and time-sensitive security upgrade for all forums. At least one of these issues is being actively exploited. UPDATE: We have incremented to "2.1.8p2" to address upgrade issues. Fixes a SQL injection vulnerability. Fixes a user registration vulnerability. Hardens the UserModel against potential abuse. Stub content being re-created on utility/update on private communities. Increase permissions required for massing banning (from Moderation.Manage to Settings.Manage). Collect additional information about mass-banning changes. Removes super-admin permissions from secondary accounts on utility update. 15 files changed. View the diff. We strongly recommend against doing partial upgrades. Never modify core files; put your changes in a plugin or theme. @Nyr Thank you, I will have it corrected shortly. The update as been amended. We accidentally included a call to array_column which was not added to PHP until 5.5. I substituted ConsolidateArrayValuesByKey, incremented to 2.1.8p1, and updated the first post in this discussion. Hi i would like to update my forum but can't reason. Is there a way arround? As long as your server is fast enough to do it in the standard time limit, you should be fine. How can i update from vanilla 2.1.6? I just tried updating from 2.1.6. The utility/update says simply 'update failed'. Enabling debugging only gives me a couple of errors about my theme cache. 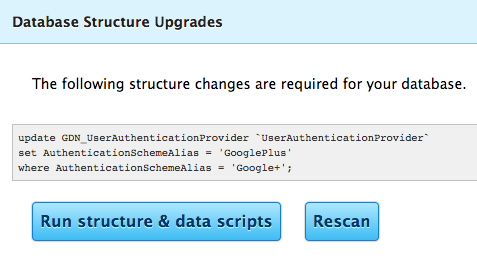 Site seems to be working, but going to utility/structure says there are a couple of google-related updates required; clicking the 'run scripts' button reports success but when I re-scan, they're back. Can you post the update it's requesting repeatedly? Did you try disabling third-party addons? updating from 2.1.6 give error to me saying simply "update failed". I recommend starting a discussion with the full error message. this is a known issue, if not in Github I will add it. It's okay though, your site is fine. you can ignore it. Thanks @Linc‌ ; I'll try disabling plugins tomorrow. Here's the update it can't do. And now that I think of it, I may have fudged around with the google plugin code (I just made a post about that tonight). No worries. I had noticed it before, my bad for not adding an issue in Github Doing it now. My version number says "Version 2.1.8p1"
Is the p1 bit weird? @martin2008 Do you, also, have Google+ enabled?